Beautiful colours and stamping, thanks for much for joining us at Penny Black and More challenge with tour favourite stamp. Thanks also for joining in at Allsorts this week. 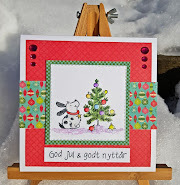 Gorgeous card with that lovely HM stamp, Dorte...love it! Beautiful card and stamp! Thank you for joining us at Crafty Sentiments and good luck! What a cute card! Loving the sketch! Aww this is really sweet! I love how you coloured the image. Such a pretty card and sweet image. Thank you so much for joining our Ribbon Girl Card Challenge and good luck! Hope to see you back soon. Ho Dot how adorable is this guy throwing his LOVE around..lol great colours fab take on the chall theme. Oh Dorte, what a beautiful card. 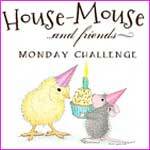 Love the die cut border at the top and the sweet little mouse image, which you have colored up beautifully. Thank you for participating in our challenge at Scrappelyst!